There is an interesting effort being mounted by the Iranian lobby in the wake of a growing strong consensus within Congress to support stiffer sanctions on the regime in Iran should nuclear talks fail for a third time. But Iran boosters such as the National Iranian American Council have lately preached a line of reasoning pointing towards the potential of various pieces of legislation being proposed in Congress as evidence of a splintering of support for harsher sanctions. 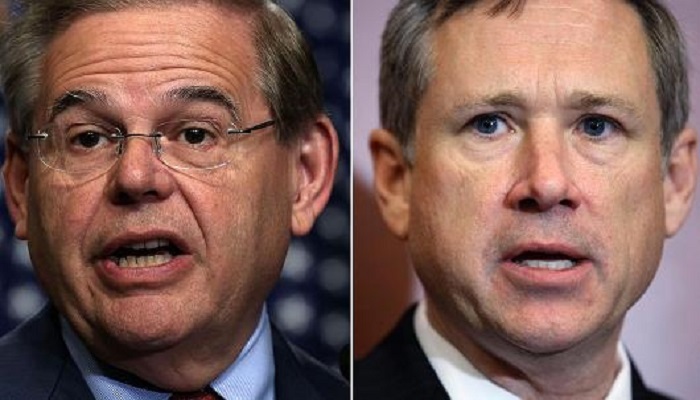 They point to proposals by Senators Robert Menendez (D-NJ) and Mark Kirk (R-IL), as well as ideas being floated by Senators Barbara Boxer (D-CA) and Rand Paul (R-KY) and even stream of thought comments made by Senators Chris Murphy (D-CT) and Bob Corker (R-TN) as proof of disagreement on the question of sanctions. What NIAC and other Iran sympathizers fail to mention is the one constant amongst all these proposals; the support for some sort of enhanced sanctions should talks fail. The only disagreement is one of timing and severity. Virtually no Senator in Congress has taken an anti-sanctions stand, nor has there been any vocal support for granting mullahs in Iran a blank check in nuclear talks. At a time when Democrats and Republican can’t seem to agree on what’s on the menu in the Senate cafeteria, there is broad, deep and universal agreement that Iran should not get a nuclear weapon and that Iran is a central character in the global rise in Islamic extremism. Various analysis of the joint proposal from Senators Menendez and Kirk, the Nuclear Weapon Free Iran Act of 2015, clearly shows this trend. It reinstates sanctions that were suspended as part of the interim agreement if a new and comprehensive agreement is not reached. It also specifically targets Iranian senior officials who are part of the religious leadership and its judicial and military systems which have been responsible for the unprecedented crackdown on human rights the past year and the expansion of militant extremism taking place around the world. It also explicitly grants the President the ability to waive the application of sanctions should he certify to Congress it is necessary for national security, completion of a nuclear deal or Iran is making no further progress on nuclear development and is in compliance with all interim agreements. One would have to wonder where the idea is coming from that there is large disagreement within Congress over Iranian regime’s sanctions giving the fact the basic outline of these terms were originally supported by an overwhelming majority of Democrats and Republicans two years ago when sanctions were originally imposed. What Iran’s mullahs see is a small window of opportunity coming on President Obama’s unilateral decision to normalize relations with Cuba to gain the same benefit in the lame duck years of the presidency. Consequently, the NIAC and other Iranian lobbyists are pushing hard the concept that sanctions are not universally supported. It is a line of reasoning doomed to failure given the massive support the idea of sanctions has right now in light of growing public unease and concern over gains being made by ISIS and Boko Haram, the collapse of Yemen and Iraq and the ongoing social media efforts by terror groups to frighten and bully the West for more beheadings. Iran mullahs and their brand of Islamic extremism is at the heart of these groups flourishing since the regime in Iran essentially wrote the manual with its own broad range of torture and public punishments such as hangings and amputations on its own people that these extremist groups have since adopted. But you will not find NIAC others denounce these growing atrocities, nor even condemn the most heinous ones. In fact, if one were to peruse the social media feeds for NIAC and its officers such as Trita Parsi, you would find virtually no condemnations. This only reveals their true nature and cheerleaders for mullahs in Iran and nothing more.